"It's the ship that made the Kessel Run in less than twelve parsecs." Han, Chewie, Obi-Wan, and Luke in the Mos Eisley Cantina! Canvas art print measures 32-inches wide x 18-inches tall. Hand-numbered limited edition of only 95 pieces, signed by artist Brian Rood! 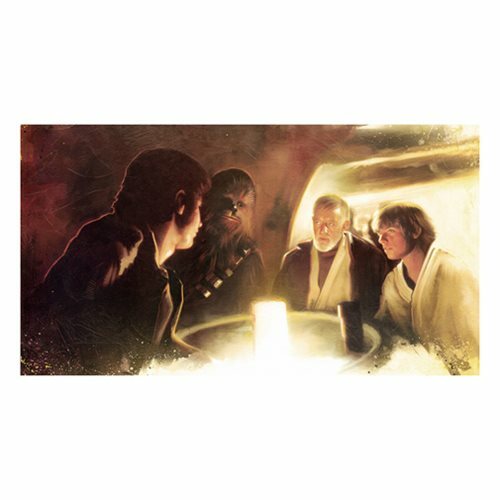 Negotiating transportation across the cosmos is always interesting, especially when you're dealing with a couple of rogues like Han Solo and Chewbacca, as seen in this Star Wars Transport Negotiations by Brian Rood Canvas Giclee Art Print. This magnificent unframed interpretive artwork by artist Brian Rood measures 32-inches wide x 18-inches tall and presents an amazing image of Han Solo, Chewbacca, Obi-Wan Kenobi, and Luke Skywalker in the Mos Eisley Cantina, inspired by A New Hope. It's a hand-numbered limited edition of only 95 pieces, signed by the artist, that comes with a certificate of authenticity.